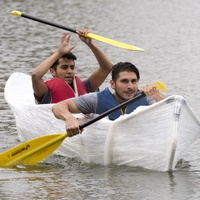 Show off your creativity with the Homecoming Week Recycled Boat Race. Participants will build boats from 70% recycled materials, then race them across the East Lagoon to determine this Homecoming Event's winner. Does your team have what it takes to win? Teams compete for 1 of 3 trophies and to earn spirit points toward the whole week.